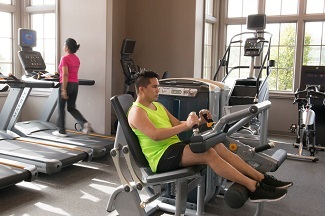 The fitness center at The Club at Riverstone provides residents with top-of-the-line equipment and plenty of options to stay fit. Helping them along that road to good health is fitness director Blake Crawford. Crawford holds a degree in Kinesiology from Sam Houston State University and is a certified personal trainer through the National Academy of Sports Medicine. He has introduced an array of group classes and personal training at The Club at Riverstone to help people reach and maintain a healthy lifestyle.